Typically a fish reproduction is a mould generated off of a physical trophy fish. Although taxidermy has been practiced for hundreds of years, fish replicas are new in comparison. 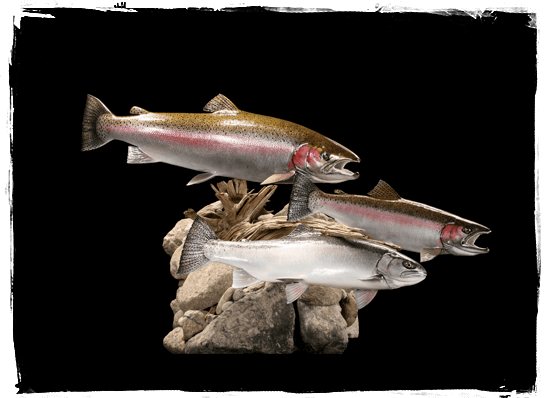 After many years of maturing a highly complex moulding and finishing operation, it is evident that Advanced Taxidermy have developed a truly remarkable product. Our success lies in the countless hours invested into each recreation and the total dedication set forth by each individual in our team. One of the advantages with our system is that there are no taxidermy incision necessary enabling us to have perfect anatomy with flawless skin and scale alignment. Detailing techniques have helped us lead the industry in the fish recreation field. Our methods have enabled us to capture even minute anatomy detail such as growth rings in the scales, contour lines of the rib cage and the texture of the fins.